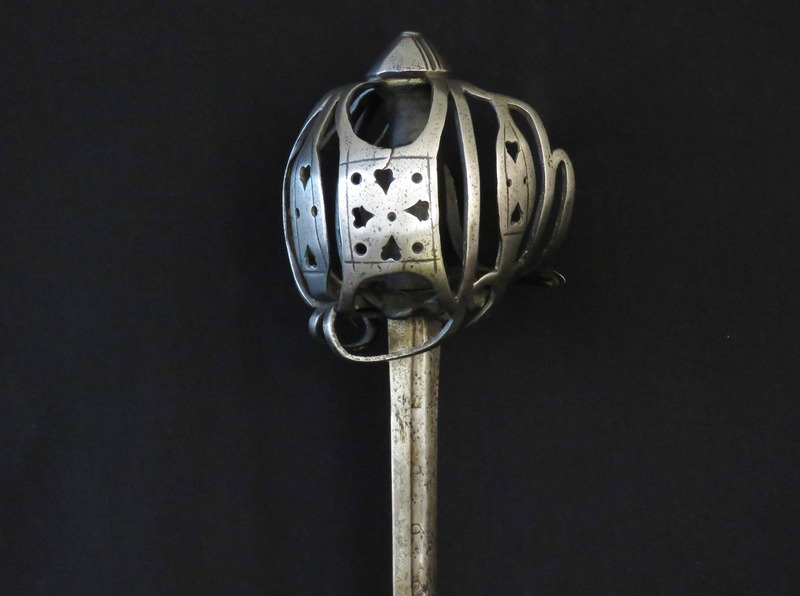 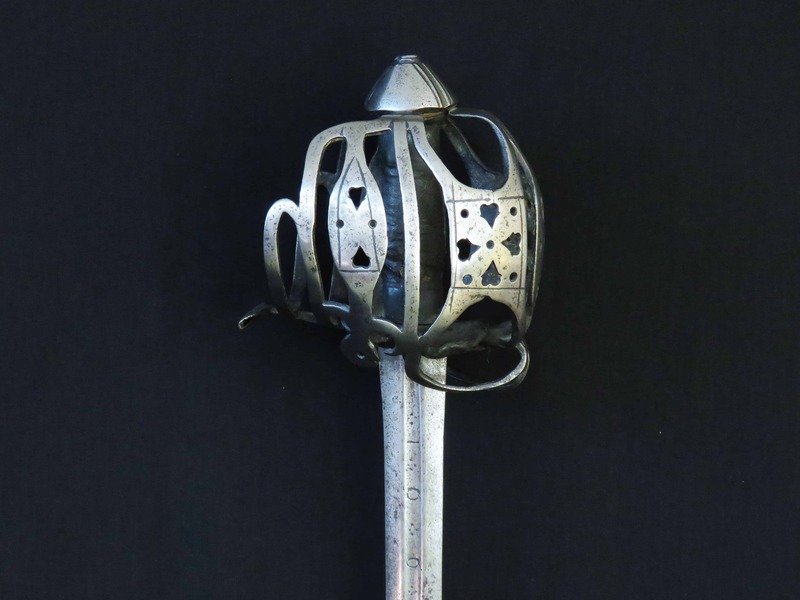 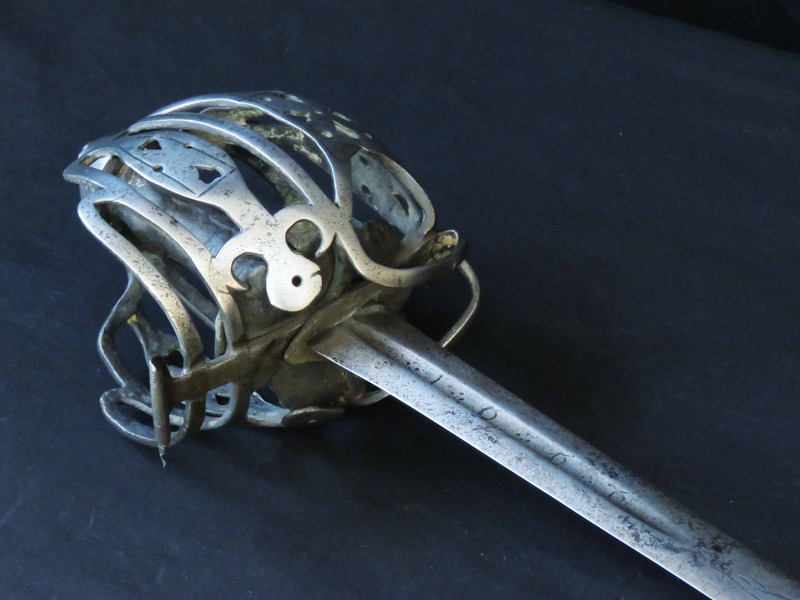 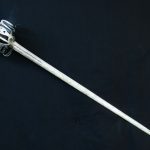 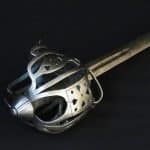 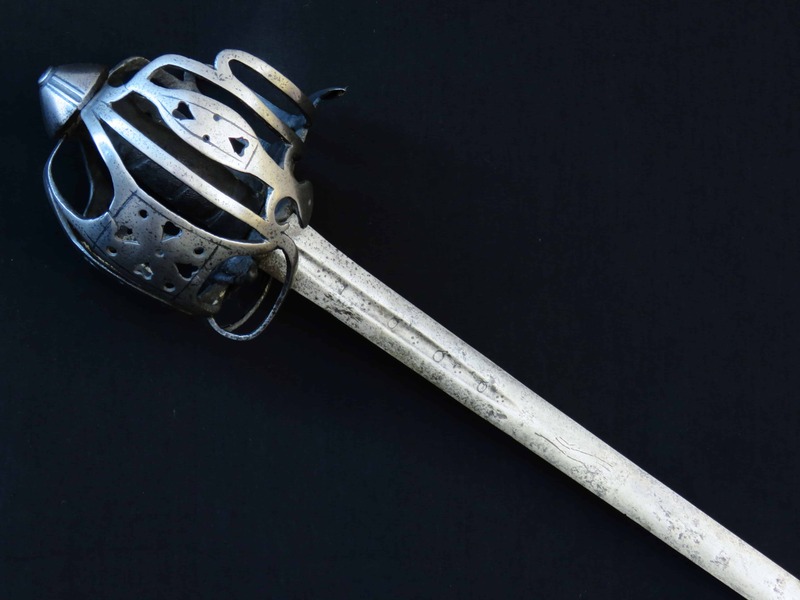 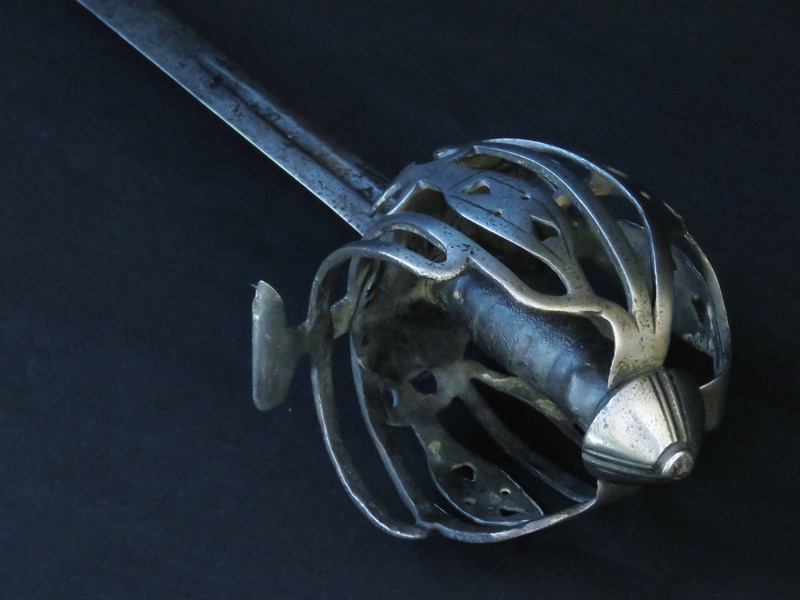 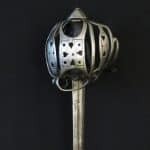 An interesting and imposing Scottish basket hilted broad sword dating to the second quarter of the 18th century. 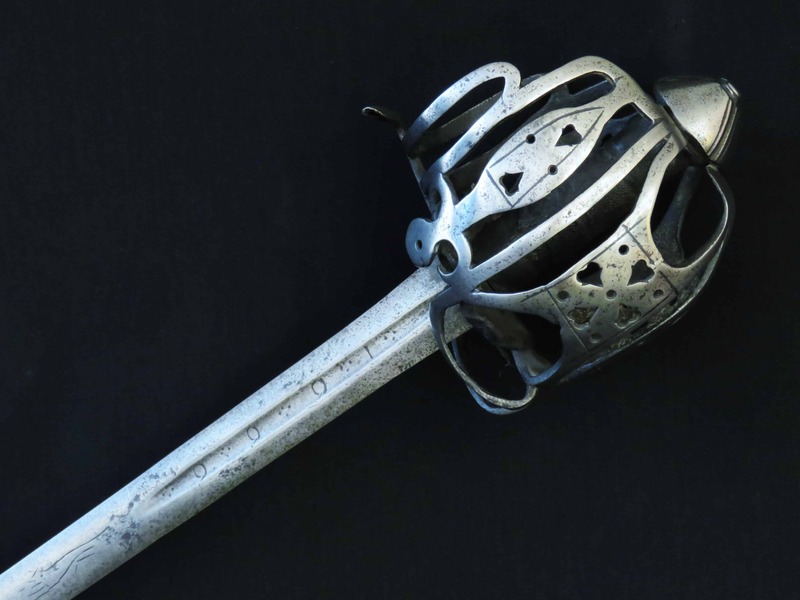 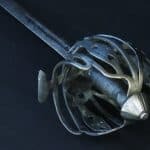 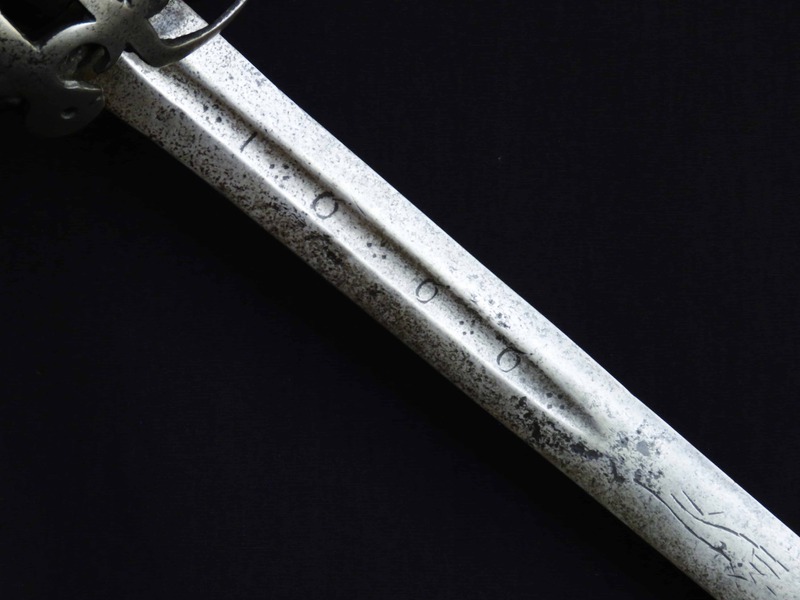 The earlier 17th century double-edged blade is marked in the central fuller either side with the talismanic date “1666” and the typical running wolf of Solingen armourers mark beyond. 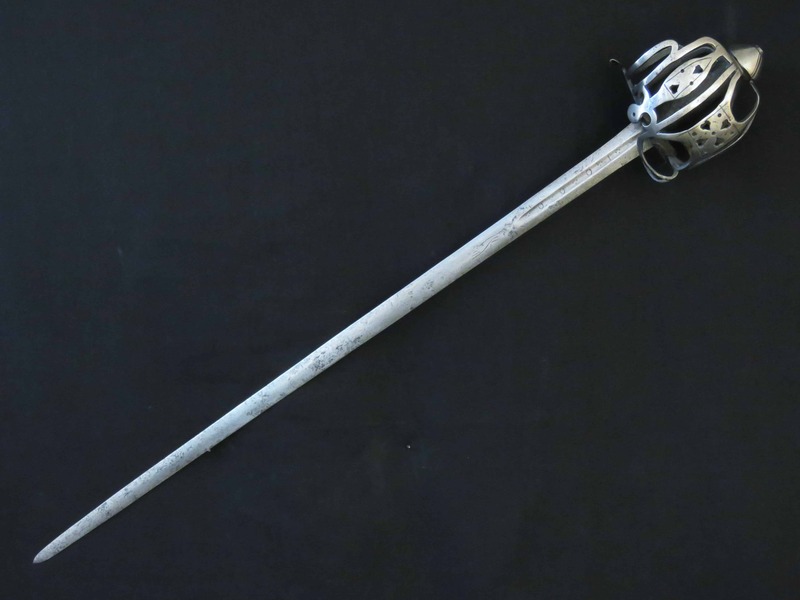 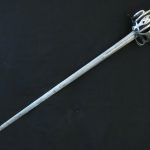 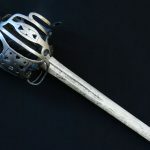 The sword was made for a right handed user, is solid, firm and well balanced in hand. 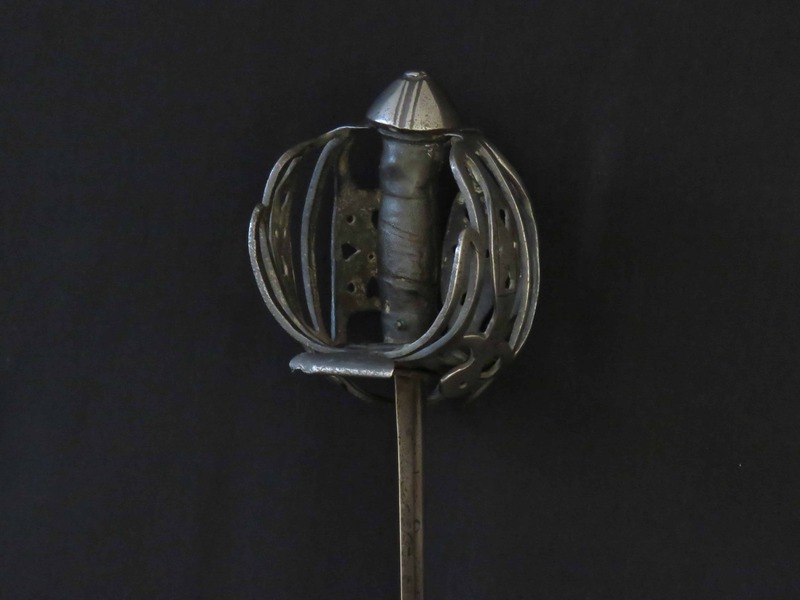 The basket guard is formed from flattened rectangular section bars. 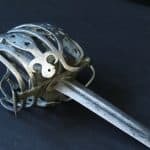 Between these are attached the main and secondary guard panels which are decorated with lines and cut with hearts and circles. 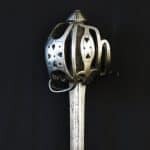 The conical pommel has a flat button on top and is decorated with four sets of filed grooves, in each case the middle groove being wider than its neighbours, which radiate from the pommel button. 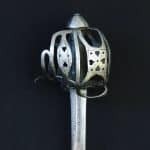 The arms of the basket guard fit into a pronounced chiselled groove which extends for the full circumference of the pommel just below its middle. 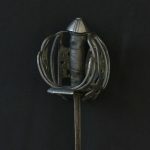 The spirally grooved wooden grip is covered with shagreen and now lacks its original wire binding. 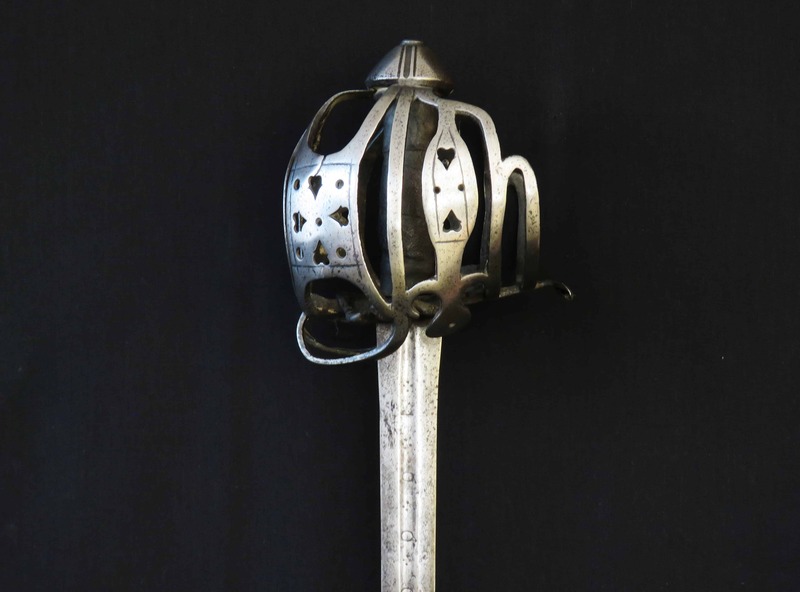 At the top and bottom of the grip two additional bands of leather have been added during the working life of the sword to reinforce the attachment of the shagreen cover. 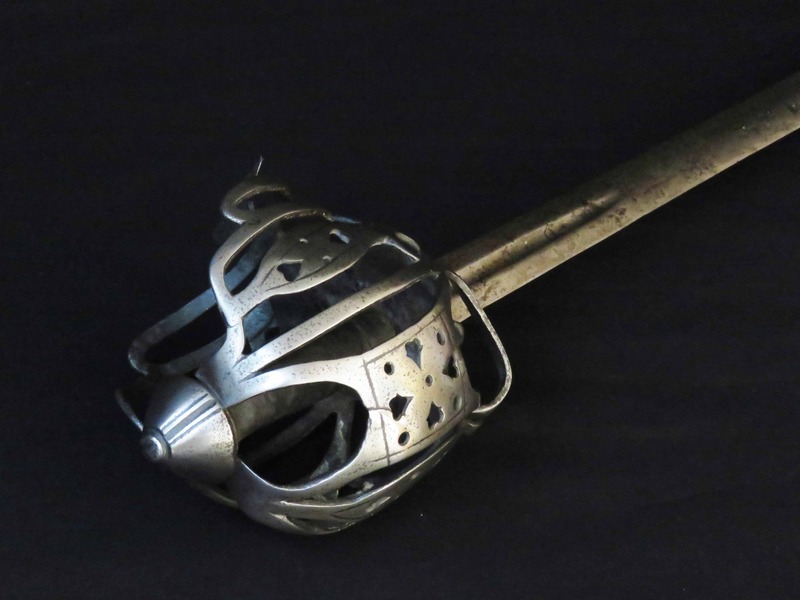 The hilt retains its leather liner. 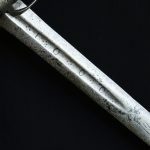 The double edged tapering blade has a pronounced fuller extending from the hilt for circa 6.5 inches (16.5 cm) inside which the talismanic numerals are applied, each interspersed with quatrefoils of dots. 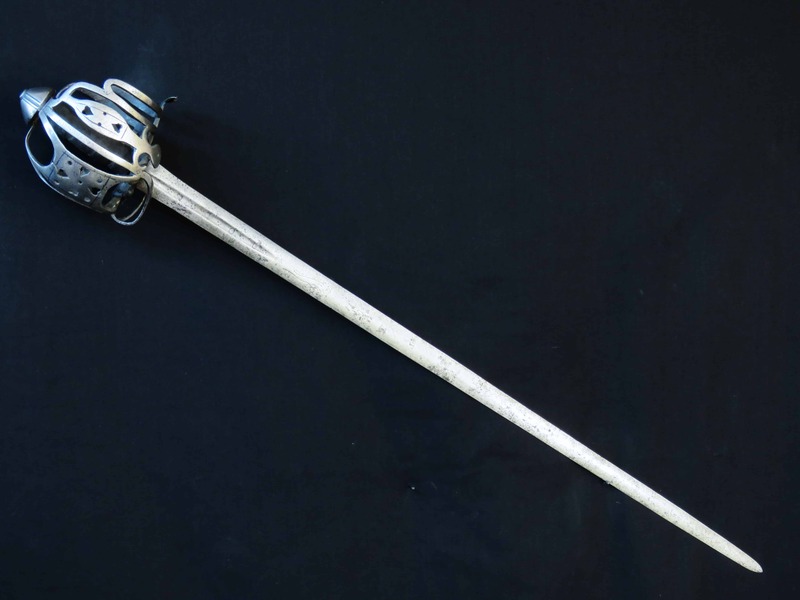 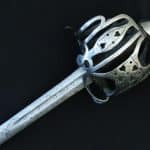 The blade length is 33.5 inches (just over 85 cm) and overall the length of the sword is 39.25 inches (99.5 cm).